Welcome to day two and my stop on the Show Your Stoff blog tour. 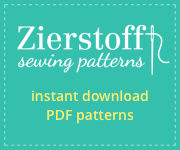 We’re featuring Zierstoff Patterns throughout the tour and I have a discount code for you below. I’m really excited to Show My Stoff today, but before I jump in, please be sure to stop by today’s other Show Your Stoff bloggers. The ALENA top was an easy pick for me with its slight kimono sleeve and high and wide neckline, both of which work really well to deemphasize my round shoulders and balance out my pear shape. Finding a match for ALENA did take some thought and I finally settled on trying the NICKI capris. My one try with rtw capris in the past looked pretty awful on me; I know there’s some magic formula for where cropped bottoms should land, but I didn’t use it. I took a chance with what felt comfortable and am super pleased that the NICKIS look good on me. I made the ALENA in size 40 using 3/4yd of a very lightweight jersey knit from Finch Fabrics. The fit is perfect and the construction was quick and easy. My sewing machine is no fan of tissue weight knits, so I stabilized my sleeve opening with Pellon Knit-n-Stable before folding it over to hem. I made the NICKI capris in size 36 using about 1 yd of a brushed poly from Sew Vagabond. Using the brushed poly was a bit of an experiment. I knew the fabric would give me some nice stretch but wasn’t sure how it would work for the pocket and fly details on the pant. It sewed up wonderfully. The faux fly and front slash pockets look neat and tidy and the stretch makes these oh so comfy. Take care pressing multiple layers though, it took a couple washings for the press mark to come out. I did make some of my usual adjustments for pants: adding a full seat adjusment and shortening the legs for my 5″3′ frame. I also topstitched the pockets closed and cut out the pocket bags. In the brushed poly I was getting pocket seams showing through. The ALENA is going to be a Tried and True pattern going forward and I have a plan in the back of my mind to do a pattern hack with the NICKI capris. In the mean time, I’m going to get good use out of this outfit for an upcoming trip to New Orleans and any other time I want to look smart this spring and summer (and secretly be really comfortable). 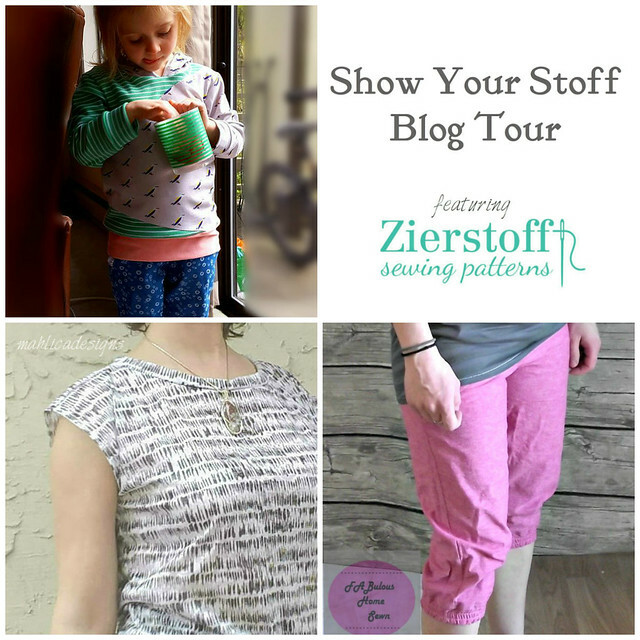 Thanks to the ladies at Zierstoff for supplying the patterns to enable me to make todays outfit, gving you a discount code, and thank you for stopping by today. Use code MahlicaDesigns30 to save 30% through the end of April. Did you miss yesterday’s bloggers? Here’s the full tour. they both look really good on you! I like the top especially, I love those kind of designs! What a beautiful combination. The color scheme is really great and both patterns look comfy.